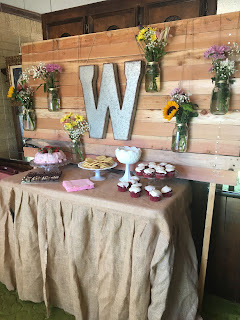 A few weeks ago I helped host a rustic Bridal shower for my cousin Emily. I didn't have a ton of time or money to spend planning or decorating, but still wanted to do something really special. The shower was perfect and I wanted to share the end result with you! The focal point of the shower was a rustic wooden backdrop for the dessert table. 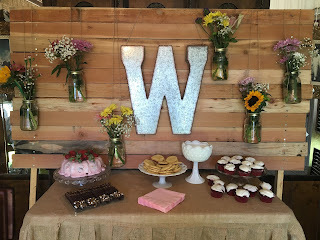 This backdrop was really simple and inexpensive to build. 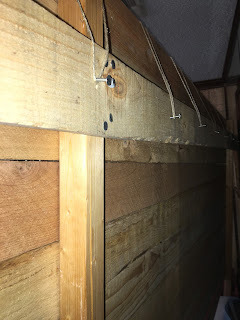 I first laid down two long pieces of wood on either side of the table and then I nailed cedar fence pickets across them. Before, I nailed down the fence pickets, I sawed off the dog eared ends so that they would have a straight end. You could buy regular wood, but these are usually really inexpensive and light. Be sure to measure the height of your table before you begin nailing the pickets across so you don't end up with a space between you table and the bottom of your backdrop. I neglected to do this and then I had to saw off the bottoms of the legs of my backdrop to close the gap. 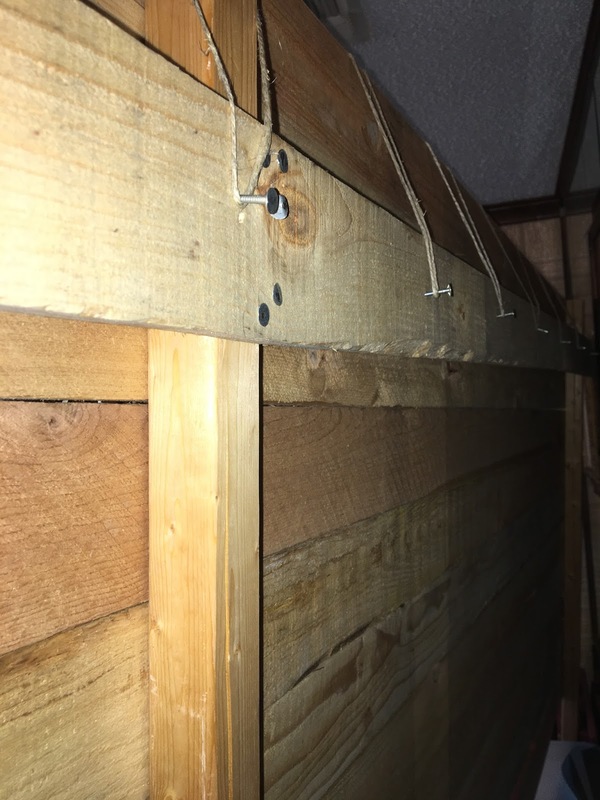 After I had completed this step, then I flipped the back drop over and nailed on board across the back and then partially hammered nails across the back to hang the jars on. The front was decorated with a large metal letter that was on sale for half off a Hobby Lobby and Mason jars from Wal-Mart. The floral was from Sam's Club. I love their floral! I actually used it for my own wedding bouquets. They have a fairly large selection online and it stays fresh for a really long time. These flowers lasted at least 10 days past the shower and I spent less than $20 on all of them. To attach the jars, I tied twine on either sides of the ring that comes with the jars and then screwed it to the jar. I then hung it over the back of the back drop. 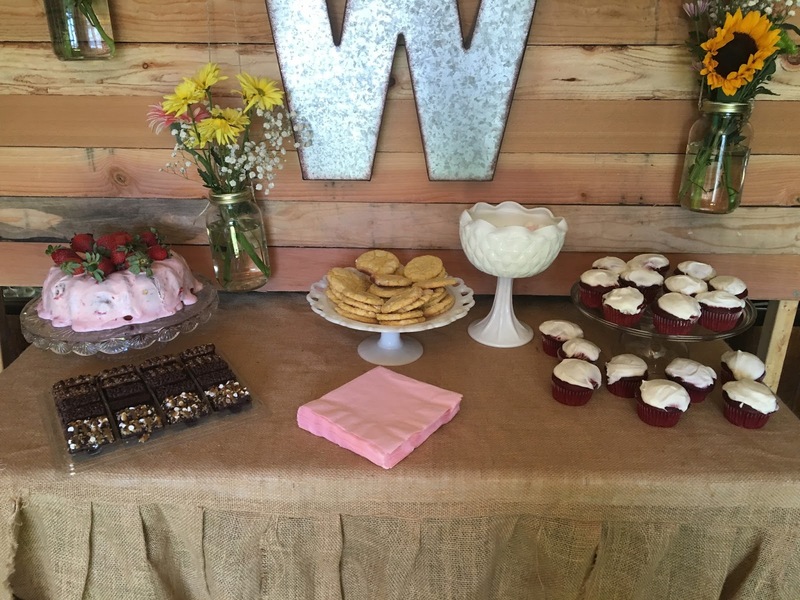 The desserts were a combination of homemade and store bought. The strawberry cake is my Grandma's recipe, along with lemon cake mix cookies, red velvet cupcakes and store bought brownies.